Every small business owner could do with more customers. They key to tapping into a new source of business could be as simple as being included in the right local business directory – one which allows customers to access results easily on their mobile phones. More searches are now made on smartphones than on laptops or desktop computers. It’s not just the future which is mobile, it’s the present. Research by Neilsen shows that 89% of the time people spend on their mobiles is using apps rather than mobile websites. It’s clear there is a massive appetite for apps on smartphones – they’re speedy, convenient, and specifically adapted to the user’s software. More and more people are looking at mobile apps for business as a way of finding out more about their local shops and services, and you could benefit from that. More than half of UK smartphone owners carry out searches daily – 52%. A whopping 80% of people use their smartphone to search for local information. Research by Telemetrics says 60% of mobile consumers expect search results to show businesses within walking distance or a short drive. That gives local business a real edge over their competitors. Research by Google and IPSOS showed that 88% of people who searched for a specific type of local business on their mobiles – like hairdressers, garages, coffee shops, or hotels – call or go to that business within 24 hours. That’s a great conversion rate. Many people search while they’re already in town for another reason, and pop in within the hour. Some research has that figure at more than 50%. A third of all searches are carried out for location and contact information – maps, directions, phone numbers, or email addresses. So if you’re looking for new customers, a local business directory listing app like Business Directory Wales will give you a great return on your investment. 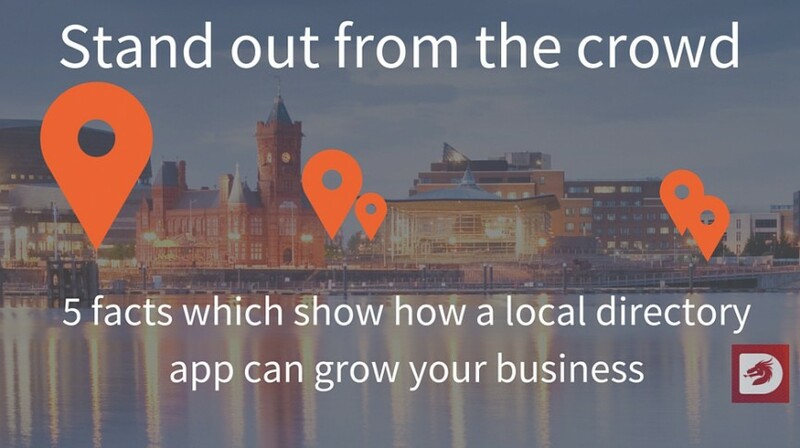 Our Business Directory Wales listing gives you a free app, your customers search for the businesses closest to them, and they contact you straight from that app without going to a separate phone or email contacts system. You can even offer them rewards using the app. Let our Business Directory Wales dragon roar for your Welsh business – we’ll help you get new customers.